Something we’ll call Impatience told me it would be . . .
. . . to spin the first length of my art yarn on a spindle. Yeah. Well, not exactly right. However, we’ll skip over the difficulties of arriving at the tiny amount of yarn on the left-hand spindle in the photo below. 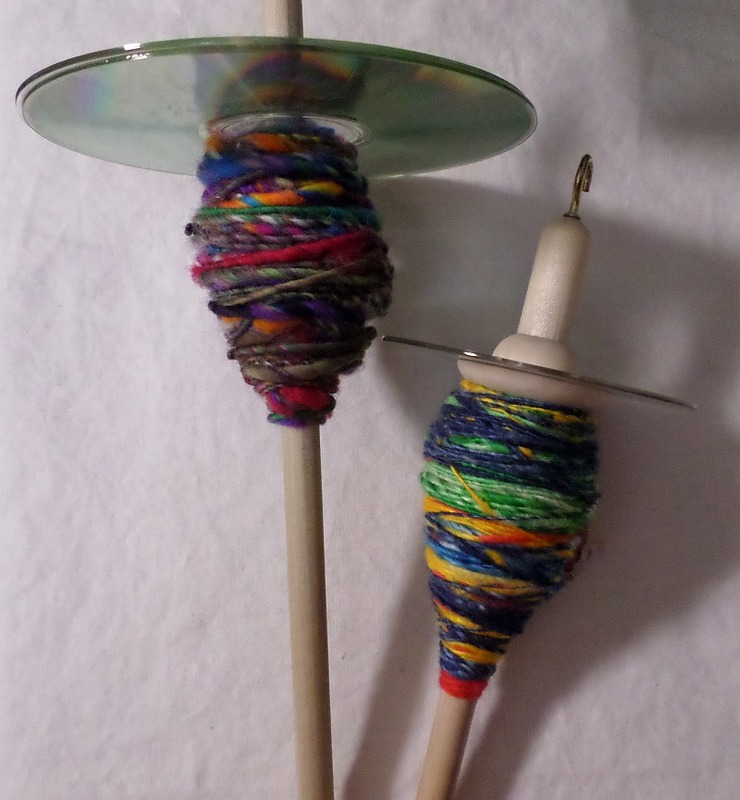 The yarn on the right-hand spindle was much easier. It’s a bunch of stretched out silk “hankies” spun onto a lightweight spindle. It was fun to spin. The left-hand spindle wasn’t exactly fun, but there it is. Two spindles of colorful singles waiting to be plied. I’ve been listening to David Copperfield, read by my favorite audio book reader, Tadhg Hynes. (Tadhg is pronounced like the first syllable of tiger.) It’s a long book—1.3 days, according to iTunes—so I’ve been listening for quite a while. While I listen to Dickens’ yarn, I spin yarn of my own. It’s amazing what I’ve accomplished in less than 1.3 days (I haven’t finished the book yet). General Conference weekend is the best, best weekend–and it happens twice every year! When I was a little girl I used to watch my older sisters crochet chain-stitch monkeys. How I ENVIED them! Never have made a chain stitch monkey, but I learned to crochet and have spent many a divine conference weekend crocheting up a storm. But now I weave. Got to have something to do with my hands while my mind and heart and spirit are feasting on the talks, prayers, and music. Last time I blogged, I posted a variation on a Loomette design. I got caught up again in the rapture of designing squares, so that’s what I’ve been doing. 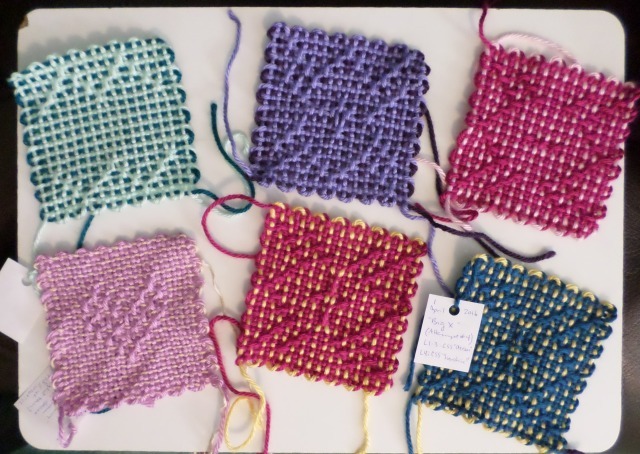 The four squares on the right, in the photo below, are variations of each other and they all involve manipulating the threads in the lower layers of the warp. Such fun, such madness, such perseverance was required on the part of the designer. It took four times till I got it right. Oh, the things you can think up! They’re watercolor heart blankets! Naturally I want to make one, and have set about designing one. I thought it would be cool–if I ever get a triangle loom–to make triangle squares to give the heart a slightly less blocky look. My mind jumped ahead to the prospect of sewing all the triangles into squares and I thought, “What if . . .?” Maybe I could weave a square that was made up of two triangles. Put the blanket on the back burner while I work on this idea.